This topic describes how to install and configure the Apigee Edge Service Broker for Pivotal Cloud Foundry (PCF). 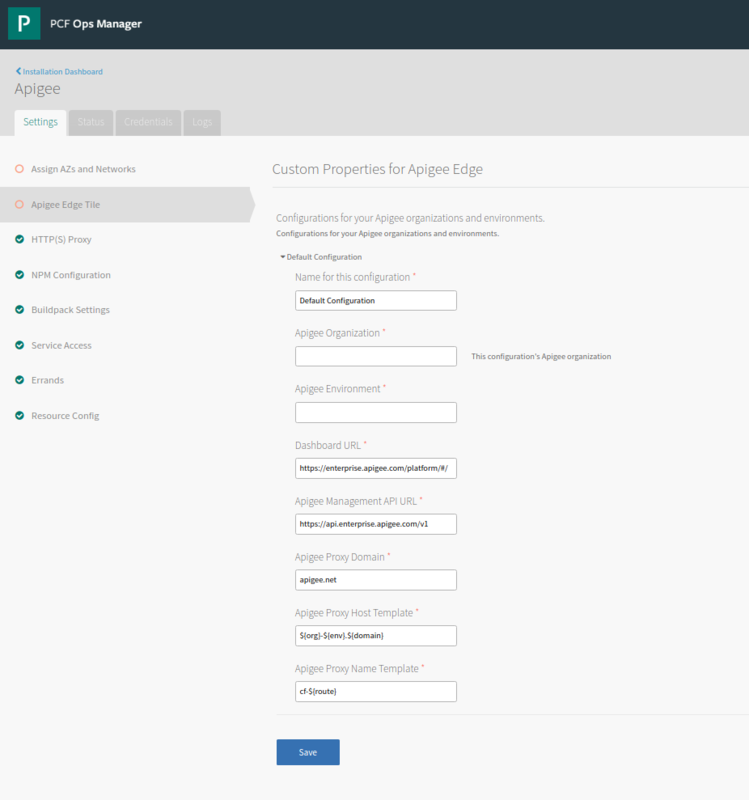 Click Add next to the uploaded Apigee Edge Service Broker for PCF tile in the Ops Manager Available Products view to add it to your staging area. Click the newly-added Apigee Edge Service Broker for PCF tile. Under Settings, click Apigee Edge Tile. Under Custom Properties for Apigee Edge, enter the appropriate values. See the following table for a description of each setting and the default values for users of Apigee Edge for Public Cloud. For descriptions of these properties, see Properties for the Apigee Edge tile. 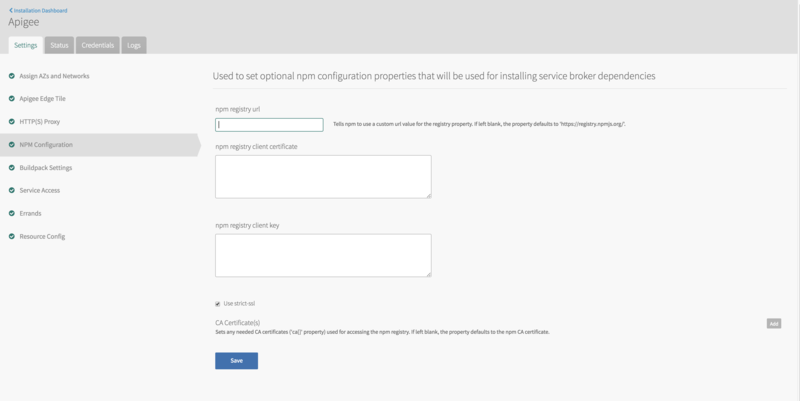 If you have your own npm registry that the service broker should use to install, click NPM Configuration in the Settings tab. npm registry URL The base URL of the npm package registry. This is not the path to a certificate file. key="–––––BEGIN PRIVATE KEY"–––––\nXXXX\nXXXX\n"–––––END PRIVATE KEY"–––––"
It is not the path to a key file (and there is no "keyfile" option). Use strict-ssl true to do SSL key validation when making requests to the registry via HTTPS. Selected (true). If you have a proxy server or firewall for calls from the service broker, click HTTP(S) Proxy in the Settings tab. HTTPS proxy URL The URL required by the https_proxy environment variable. HTTPS proxy username The username required by the https_proxy environment variable. HTTPS proxy password The password required by the https_proxy environment variable. HTTP proxy URL The URL required by the http_proxy environment variable. HTTP proxy username The username required by the http_proxy environment variable. HTTP proxy password The password required by the http_proxy environment variable. Return to the Ops Manager Installation Dashboard and click Apply Changes to install the Apigee Edge Service Broker for PCF tile. Proxying a PCF App with Apigee Edge ("org" plan) to learn how to proxy a Cloud Foundry app with Apigee Edge. Proxying a PCF App with Apigee Edge Microgateway ("microgateway" plan) to learn how to proxy a Cloud Foundry app with Apigee Edge Microgateway, where Microgateway and the app are in separate Cloud Foundry containers. Proxying a PCF App with Apigee Edge Microgateway ("microgateway-coresident" plan) to learn how to proxy a Cloud Foundry app with Apigee Edge Microgateway, where Microgateway and the app are in the same Cloud Foundry container. You can use the Ops Manager to update or add Apigee Edge Service Broker tile configuration. For example, if you want to add Cloud Foundry support for a new Apigee environment, you can create a configuration for it. In the Ops Manager, under Settings, click Apigee Edge Tile. At the top right of the page, click the Add button. Apigee Organization The Apigee Edge organization with proxies that will handle calls to your app. Apigee Environment The Apigee Edge environment that with proxies that will handle calls to your app. Apigee Proxy Host Template ES6 template literal for generated proxy host. The template that describes how the Apigee Edge host name should be generated.